I’m pretty sure you already saw the previous list we have about bed skirts – I personally loved each one because of how comfortable each bed looked like and how the spaces were actually designed to fit around the bed. It’s not usually the case but I think it is one smart move to do so that it makes ay bedroom space really fascinating and interesting. Below is a list of awesome bed skirts – printed, plaid or checkered. They come in different skirt colors but mostly with white duvet or bed covers. This list is indeed a list to look at for because even when bed skirts are not really in trend nowadays, they still invite people in because of the comfort they project on the outside – check out the list below. All other things being equal, high thread counts can indeed translate to increased comfort. Don’t be tempted to buy 800- or 1,000-count sheets, however; you’ll do just fine with a style in the 400 or 450 range. The extra thread count doesn’t make enough difference in feel to justify the price. In fact, the highest-count sheets can even be stiff because so many fibers are jammed so closely together. I like it when the headboard and bed skirt match, don’t you agree? The custom bedding was kept understated by the choice of a casual print. The bending of the striped wallpaper by the angled walls breaks a straight line and introduces movement to the room. A decorative, hand-painted serpentine chest from Italy adds function to the room while pleasing to the eye. 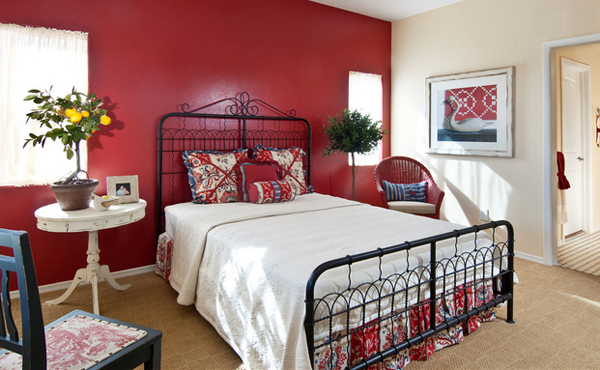 Master bedroom and bathroom have a beautiful floral motif that ties both together. Love all the red with yellow and blue highlights in this bedroom; love the fact that the pillow cases match the bed skirt too. The lavender accents in bedroom is just lovely. The pastel undertones on this bedroom is perfect – too perfect! The window treatment fitted to arch nicely; a bit matching with the drapes above the bedroom. Matching bed skirt and shams with coordinating throw pillows. 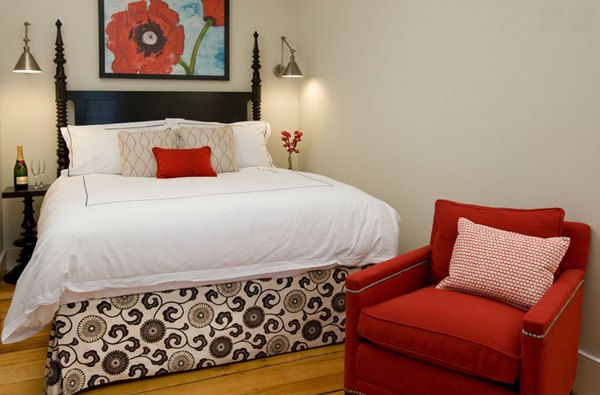 In this charming hotel room, the sconce allowed the designer to save the small nightstand space for a vase of blooms. 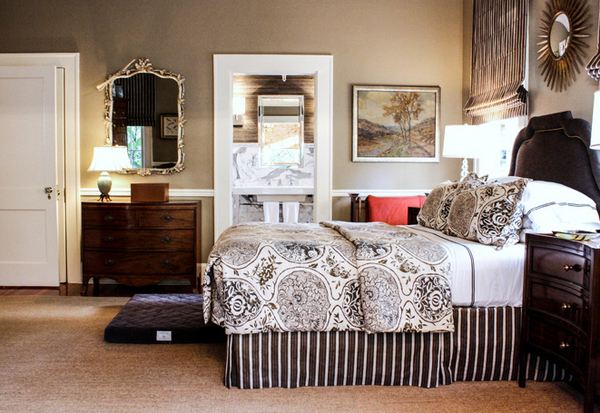 The master bedroom is decorated with a mix of antiques and has a dark palette that gives it a sense of elegance and tranquility. Not crazy about the colors, but it feels comfy. 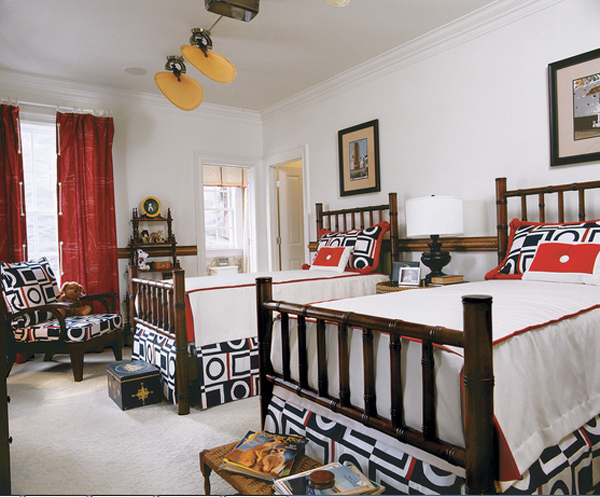 The master bedroom displays Favreau’s pattern passion. Look closely and you’ll see it starts on the walls. “The wallpaper is covered with all kinds of autographs,” says Favreau. “They range from Paul Revere to Bruce Springsteen. Extend an upholstered headboard. This gives the bed a stronger presence. 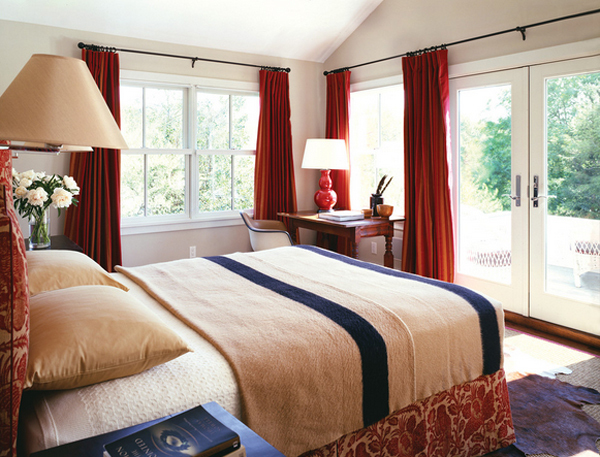 It’s a good opportunity to get more mileage out of a fabric and create a daybed feel in the corner. 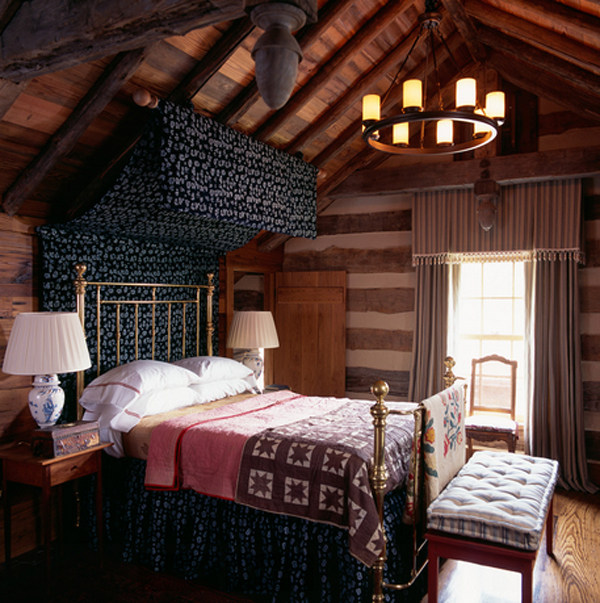 The interiors of this new hunting lodge were created with reclaimed materials and furnishing to evoke a rustic, yet luxurious 18th Century retreat. I love the contrast of the bed skirt and the duvet and the walls too. If your headboard has a unique shape, play around to emphasize it. 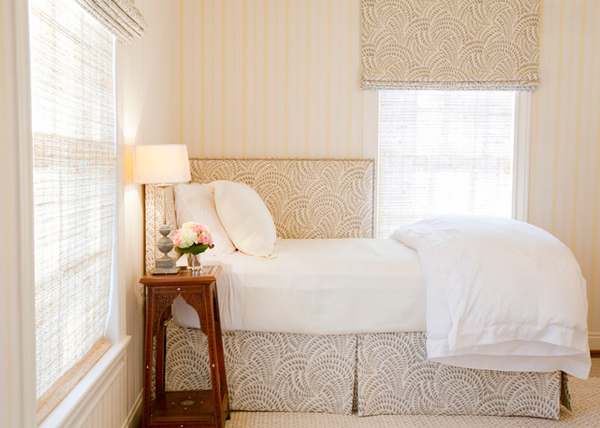 These tiny little mirrors are the perfect exclamation point on these dual headboards. This 6500 s.f. new home on one of the best blocks in San Francisco’s Pacific Heights, was designed for the needs of family with two work-from-home professionals. The color purple historically symbolized nobility and opulence, because the dye was so rare and costly to extract – it was made by crushing the shells of thousands of shellfish. 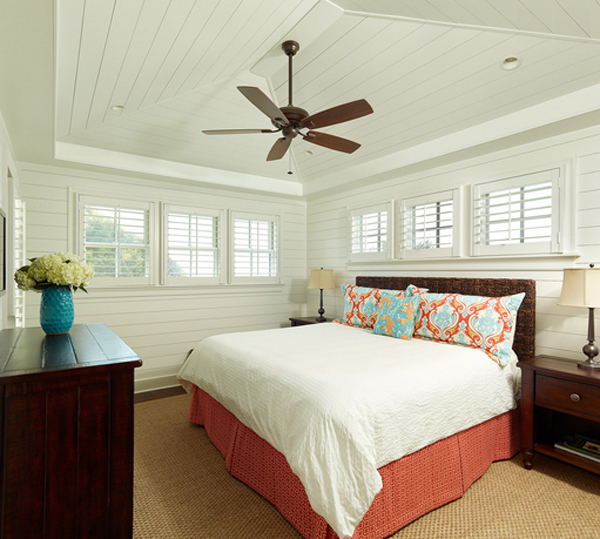 The country inspired guest bedroom features a white painted wood headboard with scalloped details. The bedding includes a matelasse bed cover and euro shams, a striped bed skirt and shams, and decorative throw pillows with a marine print. This is totally an interesting list indeed. 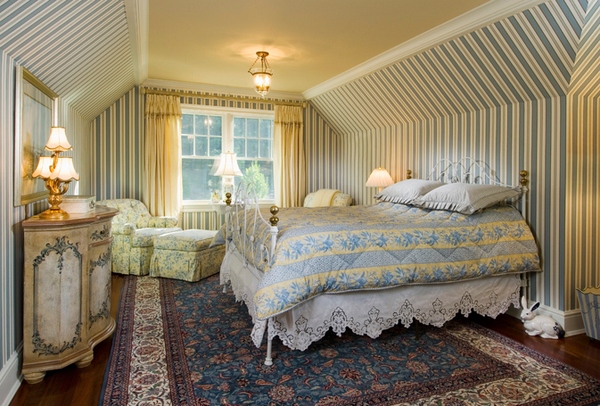 The designs and print of each bed skirt above is just as stunning as the next one. There are other bed skirt designs that are totally as interesting as this one. We are sure that this list will be an inspiring one because at some point you would want to have your bed somehow like this one of the beds above.